Shoppers are speaking out against unsafe working conditions found in the Bangladesh factory building that collapsed last week. Dozens of consumers took to social networks after more than 400 workers were killed when a garment factory building in Bangladesh collapsed last Wednesday. The message that shoppers like Judy Caulfield had for retailers: Shame on you. "Do the people running this company sleep at night knowing that they are partly responsible for the deaths of so many people?" she asked on the Joe Fresh page. While some wondered how retailers could tolerate such conditions at factories they buy from, others threatened that they would stop shopping at stores connected to the collapse. "I have a Joe Fresh gift card and was going to go shopping there. Now I'm not so sure," Linda Bowser Fallis posted on Joe Fresh's Facebook (FB)page. "Until companies like yours control the working situation and pay decent wages, it will happen again. And again." The building that collapsed housed a factory that made goods for Joe Fresh, some of which were destined for J.C. Penney (JCP) stores, since the brand has a partnership with the department store. The factories in the collapsed building had, at some point or another, made items for The Children's Place (PLCE), Dress Barn, Benetton and British retailer Primark. One factory, Ether Tex, listed Wal-Mart (WMT) as one of its buyers, though the retailer said it had no authorized production in the building. People also unleashed their anger at retailers that didn't have any connections to that specific building, but are known to source from factories located in Bangladesh, like H&M. One H&M shopper posted that he will start shopping there if the retailer stops "using slave labor in [its] clothing production." Many of the comments pointed out how little people around the world knew about where their clothes come from, and just how much they cared to know. "Just wanted to ask if you import any of your clothing from Bangladesh ... and if so have [you] done anything to fund ... safety programs," Jonathan Gottleib posted on the J.C. Penney Facebook page. "I need to know from each corporation before I decide if I want to buy anything from them." 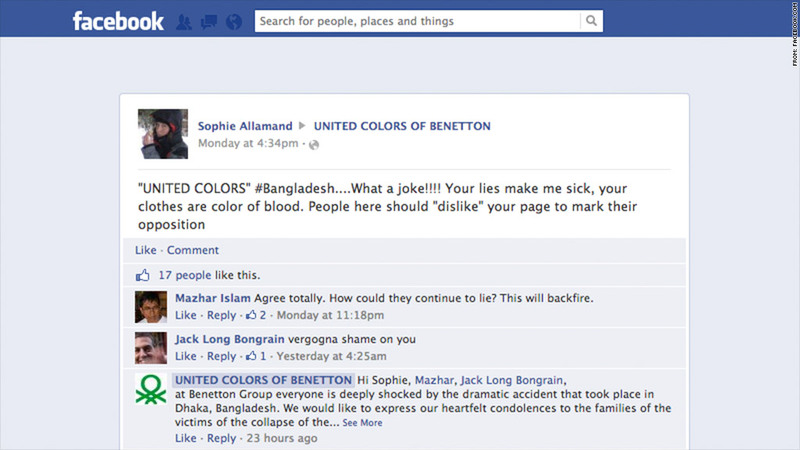 Jackie Lynch, a Benetton shopper posting from Melbourne, asked how many of the retailer's clothing lines come from Bangladesh and if it can reassure customers that its garments are made in safe factories. The confusion stems from the fact that companies often aren't transparent about how they monitor production overseas. Many large companies monitor suppliers and have guidelines on health and safety standards, but experts say that the results of these audits aren't made public. That makes it difficult for any consumer who wants to check if a company is actually conducting the audits or terminating relationships with suppliers who don't meet standards. Joe Fresh, H&M, Benetton and J.C. Penney didn't respond to questions on what they plan to do about their customers speaking out.